Dawnmist WineWax Ultra is a high-performance, second-generation wine-bottle sealing compound introduced in 2014 as an improved successor to our very successful WineWax Original sealing product. WineWax Ultra takes an entirely novel approach to the problem of making a seal to glass, cork and even screw-caps that tolerates expansion and contraction with changes in temperature without cracking: instead of simply being a soft material (which may be fiddly to remove), it is an advanced non-linear material that feels quite firm and "plastic-like", but "creeps" so it can accommodate thermal expansion without cracking, and behaves in a more brittle manner when subjected to sudden shocks, so that it breaks away very cleanly from bottle and cork alike when the time comes for the bottle to be opened. For large-scale users, such as professional winemakers, we offer our new, enhanced-performance WineWax Ultra in bulk, in the form of "Bricks" of 500 grams (appx. 580 ml) each. The product is identical in every way to the 120 gram discs of WineWax which are offered for smaller-scale users, but the 500 gram Bricks offer a significant cost saving for larger-volume users, as well as being more convenient to handle than the small discs when a large amount of wax is to be melted for use. Full details of WineWax Ultra, including product data and instructions for use, will be found on the Main WineWax Page. For Bulk WineWax, there is a Minimum Order Quantity (MOQ) of 5 Bricks (2.5kg) of any one colour because Bulk WineWax is dyed to order from our large stock of undyed product, and 2.5kg is the smallest batch that our equipment can handle without excessive waste. Customers requiring smaller amounts than 2.5kg should instead order WineWax in the form of the 120 gram discs offered on the Main WineWax Page; these are available from stock in all colours and there is no MOQ for them. The price for your Bulk WineWax depends upon the total amount ordered, irrespective of how many different colours of WineWax make up your order -- so, for example, if you ordered 10 Bricks of Black and 10 Bricks of Yellow, you would pay for all bricks at the 20-49 Brick price. This allows you to obtain discounts for larger orders even if they are made up of many colours; this pricing strategy is commonly called mixed-quantity pricing. Please remember however that there is a Minimum Order Quantity (MOQ) of 5 Bricks (2.5kg) of any one colour. Please remember that shipping is additional to these prices and is charged at cost. For consignments up to 60kg to UK addresses, excluding "remote" areas (postcodes IM, HS, ZE and Channel Islands), you can simply look up the shipping charge in the Shipping Charge Ready Reckoner table below; for delivery outside the UK, to "remote" UK locations, or consignments larger than 60kg, please contact us and we will quote the applicable shipping cost. Shipping charges quoted in the Ready Reckoner are for the usual economy courier service that we use, which typically takes 3 working days (maximum 5). If you require your WineWax more urgently, we are normally able to use an overnight courier service instead, subject to extra cost; since the overnight service is not available to all locations and costs are 'banded' according to distance, we are not able to list a flat pricing structure for it -- therefore, if you require faster delivery than the normal economy service, please contact our sales office and we will quote the cost for overnight service to your particular location, if overnight service is available. Local customers may wish to collect their orders in person and some customers may wish to arrange their own delivery service; in either case there is no shipping charge. If this applies to you then please contact us to make the necessary arrangements for collection. Please be aware that any collections from Dawnmist must be arranged with us in advance. For customers outside the UK, we are able to export to virtually any country in the world. For export customers wishing to make their own arrangements for shipping, the prices below apply on an Ex-Works (Exeter) basis and include packaging suitable for typical postal/courier-type shipping services (each brick has a heat-sealed polythene sleeve, these are shrink-wrapped into groups, padded with kraft paper and packed in sturdy cardboard boxes). We can also arrange a delivery service for export customers, subject to additional cost; we regularly ship WineWax throughout the European Union and beyond, via both express and economy services. Please contact us with your requirements. Please note that we cannot ship Bulk WineWax to PO Box addresses (UK or International): PO Boxes are maintained by the Post Office in each country and are reserved for post only -- they are not available to independent couriers. Therefore please ensure that you provide us with your actual geographical (street) address if you normally use a PO Box for correspondence. New lower prices on WineWax Ultra! or 10 bricks in any one colour for Custom Colours. Any Questions? Click here for the WineWax FAQs and Troubleshooting Guide. We are able to supply Bulk WineWax to virtually any location in the world; shipping is charged at cost and is additional to the prices shown on this page. Please email our sales desk with your requirements and we will be pleased to quote the cost and expected timescale of delivery to your location for the goods you require, or for UK delivery simply use the Shipping Charge Ready Reckoner table above. We can accept payment by Bank Transfer (UK or International), PayPal, Credit/Debit Card, or Cheque -- and we can, of course, provide a Pro-Forma Invoice (in PDF format) upon request. All prices and payments are in pounds sterling (GBP) unless specifically agreed otherwise. All goods must be paid for before despatch unless we have explicitly agreed credit terms. Bank Transfer: If you wish to pay by this method, we will email you a pro-forma invoice showing the total price and the bank details for payment (Sort Code and Account Number for UK customers; IBAN and BIC codes for non-UK customers). Credit/Debit Card: For card payments, we will email you a special Web link (URL) which, when clicked, takes you to your own unique Personal Payment Page. This contains an "Add to Basket" button that is pre-set to match your order details and total amount of money. Clicking the "Add to Basket" button will take you to our secure card payments service, which is operated by PayPal Inc. Simply click to specify that you do not have a PayPal account, and then you will be prompted for your card details, and a one-off payment will be taken without any need for you to sign up for an account with PayPal. This gives you the convenience of a card payment combined with the guaranteed security of the payment being handled by PayPal Inc -- so you can buy online without any worries about security. PayPal: If you wish to pay via PayPal, we will issue you with a Personal Payment Page, exactly as for a credit card transaction (see above) and you can simply choose to pay it from your PayPal account rather than from a credit card. Cheque: As a final option, payment can be made by cheque and sent by post. Cheques must be in pounds sterling (GBP) and drawn on a UK Bank (for non-UK customers, your bank should be able to draw up such a cheque for you). Please be aware that goods will not be despatched until cleared payment has been received and therefore any of the above three payment methods are preferable to a cheque if you require quick delivery. Cheques must be made payable to "Dawnmist Studio". We are now able to offer custom-made colours of WineWax! We can manufacture WineWax Ultra in almost any (non-metallic) colour you can imagine, for example to match your corporate colour-scheme or to make your product truly unique in appearance. When you request a new custom colour, we will formulate a colour of WineWax Ultra, which matches as closely as possible to your specified target colour. You can either send us a physical sample of the colour to match, such as a bottle label, or you can quote a Pantone Uncoated ("U" series) number. We will then send you a small sample of the new colour wax for your approval, along with a unique Shade Reference Number (SRN) by which your colour is known to our computerised dye-mixing system. Using the SRN for your colour, you can then order as many Bricks of your colour as you need, whenever you need them, and at the same price as our stock colours, subject only to a Minimum Order Quantity (MOQ) of 10 Bricks (5 kg) for any custom colour. (Please note that the MOQ for Custom Colours is greater than that for stock colours because of the additional setup required for making Custom Colours). 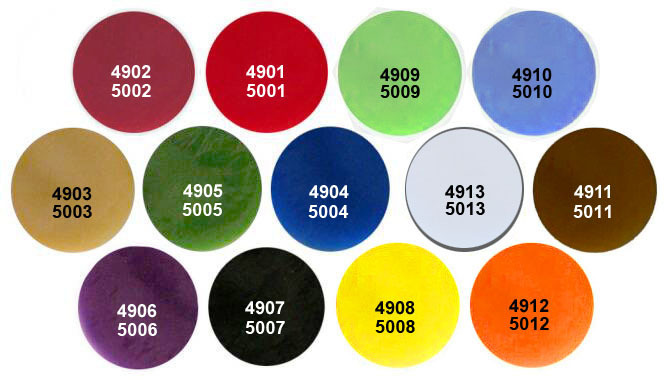 The product code for ordering a custom colour is "DFC-5099" plus your unique SRN -- so if your SRN was, for example, "JB1023", then the product code would be DFC-5099-JB1023. Custom Colour creation is available at no extra cost if an initial order of at least 50 Bricks (25 kg) of the new colour is placed at the time when colour creation is requested (and that order is, of course, only sent out once you have approved the colour that we create for you). Otherwise, a once-only Colour Formulation Charge of £25.00 will be made to contribute towards the cost to us of formulating the new colour, since colour-matching is a labour-intensive process. If you have previously had us create a custom colour of WineWax Original (with a DFC-4999 order code), you can still use the same SRN to order the same shade in Ultra; we will reformulate the same shade in WineWax Ultra at no charge. Normally the conversion process will produce a very close match to the original colour, however WineWax Ultra does render colours slightly differently to Original and therefore a totally perfect match under all lighting conditions cannot be guaranteed; therefore, if you would like us to submit a sample of the converted colour for your approval prior to manufacturing the batch, please inform us when the order is placed -- this service is provided free of charge. WineWax is available in the following stock colours; exactly the same range of colours are available in both Original and Ultra, so the colour swatches below apply equally to the current WineWax Ultra range (DFC-5001 to DFC-5013) and to WineWax Original (DFC-4901 to DFC-4913, now discontinued). (DFC-49 Range) No longer manufactured. Discontinuation of WineWax Original: In June 2014 we reduced the price of the second-generation, high-performance WineWax Ultra to match that of WineWax Original, and began phasing out Original since its only advantage over Ultra was lower cost (please refer to our WineWax FAQs Page for full details including advice on migrating to WineWax Ultra). We recommend that new users should always use WineWax Ultra; for established users of WineWax Original we do still have very limited stocks of Original: if you wish to purchase further supplies of Original, or have any questions about migrating to Ultra, please contact our Sales Office.